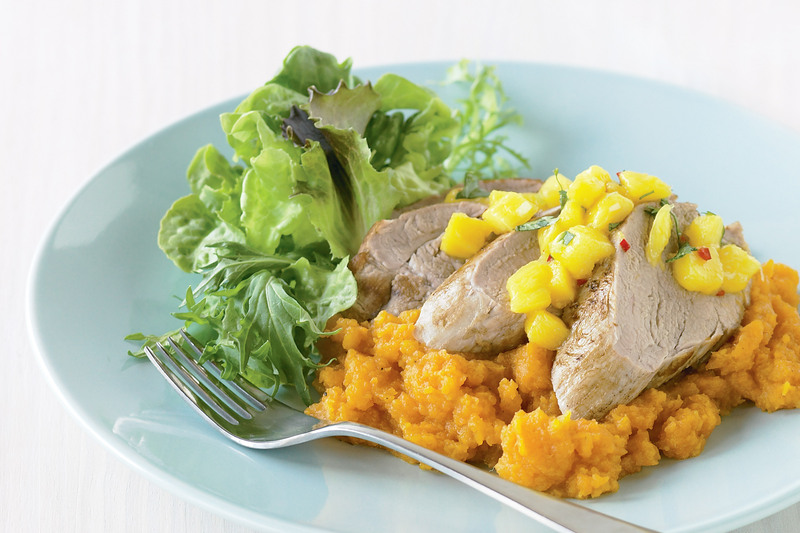 Assemble fresh produce, protein-packed pork and leafy greens in one great-tasting meal. Preheat oven to 200°C. Combine the mango, chilli, shallot, coriander and lime juice in a large bowl. Place the sweet potato in a saucepan and cover with cold water. Bring to the boil over high heat. Reduce heat to medium and cook for 15 minutes or until tender. Drain and return to pan. Add the orange juice and use a potato masher or fork to mash until smooth. Meanwhile, heat a non-stick frying pan over medium-high heat. Spray with olive oil spray to grease. Add pork and cook for 2 minutes each side or until browned. Transfer to a baking tray and bake for 10 minutes or until just cooked. Cover and set aside for 5 minutes to rest. Thickly slice the pork across the grain. Divide the mash among serving plates and top with pork and salsa. Serve with mixed salad leaves.